Firecrackers exploded around Colombo on Monday as Sri Lankans celebrated what they hoped would be the end to a civil war that has plagued the nation since 1983. 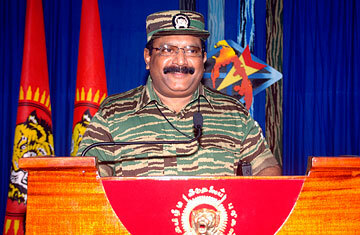 At 1:40 p.m., Sri Lanka's government radio announced that Velupillai Prabhakaran, the elusive leader of the Liberation Tigers of Tamil Eelam (LTTE), was killed early this morning by special forces in the island's northern Karayamullavaikkal area. The 54-year-old Prabhakaran, who headed the Tamil separatist movement for 33 years, had been trying to flee the shrinking 100-m by 100-m pocket of land still under Tiger control in an ambulance when troops intercepted the vehicle, shooting those inside. Hours before Prabhakaran's death was announced, the Defense Ministry had declared that at least six top Tiger leaders were killed in fighting in the early-morning hours, including Prabhakaran's 24-year-old son Charles Anthony. All of the leaders, including Prabhakaran, appeared to be fleeing in the same two-vehicle convoy. The entire country had been decked in the Sri Lankan national flag since Sunday, anticipating the final victory over the Tigers. President Rajapaksa is due to address the nation from parliament on Tuesday. Pro-Tiger websites had reported that the Tiger leaders had contacted the International Committee of the Red Cross (ICRC) on Sunday morning to inform the aid group that only some 1,000 people remained in the narrow area under Tiger control, including the Tiger leadership, nonmilitary LTTE members and cadres, some injured. The pro-Tiger site TamilNet had reported that LTTE leadership told the ICRC that "there was no firing from the LTTE side" and "urged the ICRC to evacuate the wounded." Both the leaders mentioned in the report were later killed by government forces. What's next for the Tigers? The government has raised the possibility of the remnants of the LTTE regrouping into a diffuse guerrilla operation. But without its top leadership, a personality-driven movement like the LTTE is unlikely to last long. It could also continue in some form in the Tamil diaspora, though its reason for being  the creation of a Tamil homeland, or eelam  is essentially destroyed. The leadership of what remains of the Tigers  mainly its international network  is likely to be assumed by Selvarasa Pathmanathan, who now heads the global operations but who was better known as the Tiger's chief arms-procurement agent. Prabhakaran is believed to have given some instructions to LTTE representatives in Malaysia and elsewhere, but it is unclear what his intentions were.